Brought to you by the company that manufactures the best selling small car in North America, The Valkyrie is “fat” in every respect. Reminiscent of a “Boss Hoss” without the bulk of the V8, The Valkyrie invokes dreams of blasting across the Mojave Desert at triple digits without overheating. I made such a run last century with Drag Racer and fellow motorcycle enthusiast George Brooks of Redway Ca. While we both owned and rode Harley Davidson at that time, George had looked for a trouble-free motorcycle stout enough to haul his custom motorcycle camping trailer. I had been with him down in Laughlin, Nv., when he blew his custom FLHTC motor towing his luggage trailer. It couldn’t take the combination of load drag and excessive desert heat. It was a damned expensive weekend for Geo. While I didn’t trade in my Harley for a Honda the following week, from that day forward I was ever impressed by the engineering balancing act that is Honda Powersports. 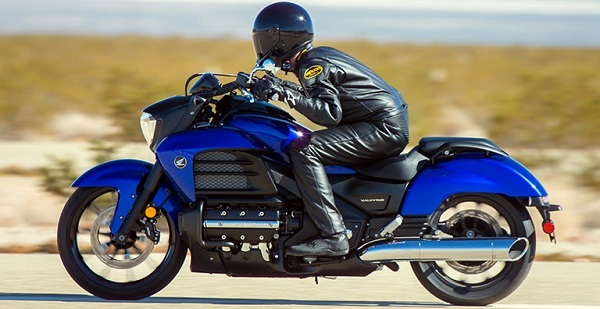 Taking a look at the new generation’s specification we find that the bike will share the same powerplant as the Goldwing. Same concept, bigger engine. Stay up with me here… Take a car displacement sized engine ( 1833 c.c.) and place it in a 67.2” wheelbase, low center of gravity frame engineered to handle. Water Cool it, and connect it to the back tire with a 5 speed transaxle and final shaft drivel. Take a look at the photo and use your imagination. Throw on a factory travel bag or two and go for it. With a fuel capacity of 6 .1 gallons and a suspected mpg surpassing the 40 mark, you’ll welcome a break stop after 200 miles or so. If it’s ride and handling characteristic is akin to the Goldwing, you’ll find this latest addition to the Honda cruiser fleet to be mechanically bullet proof and a pleasure to ride. While the futuristic style of the Valkyrie ( Darth Vader meets Transformer Man) will not appeal to all Honda fans, as with the original, this beast will have a cult following. Personally, I have an idea or two that would round out the style a bit. Once again, this Honda departure is color sensitive. A black or dark silver metallic or gunmetal grey would bring it back to earth a bit. I find the overall styling of the Valkyrie to be encroaching on Ducati,Triumph and Victory design cues. I'm not fond of the " chunky" surplus look of the rear fender. It's screaming to be covered with a quality saddle bag. As to the lack of wind deflector? I'll leave that up to Honda. As to the remainder of personal opinion generated design critique? I’ll leave that up to die-hard Honda fans to generate. For those interested, you can read the specification chart here. Perhaps one of my readers could educate me as to what 3-D - mapping is. ABS braking, I got it, I like it. While Honda isn’t offering an estimated retail price at this time, I suspect it will land short of $16,000. We’ll see where it goes. In the mean-time, If you see one on the road in the western United States before the end of the year, contact me at Torque News, I’d like read your personal review of the Valkyrie. Looking forward to taking one out for a test run! I had the first Gold Wing in 1975, it was available in red or blue and was 999 cc's. Welcome LJ. Could be. Mine was a 1976 model purchased in Southern California. It was banana yellow. You can find a photo of the bike on Wikipedia. And, like yours, it was 999 cc's thanks for dropping in.